*I don't usually blog about these things but I think this is important. Something is going on in Spain nowadays. What is it? May it be that it has an unemployment rate of 20% that goes up to 40% in young people? May it be that it is going through an economic crisis? May it be that there will be elections in few days with no real political options that are worth to vote for? Or it may be all of them. And the result of all this is what you can see on the streets of the different cities of Spain in the last days. Citizens are fed up with the situation of the country and they want to shout it out loud: "Real democracy now!!!". And they do more. they are taking the cities. They are meeting in different cities to let the government know that they don't agree with the way this country is lead. They are camping in public squares to be seen and remind their fellows that Spain has a big problem. And it's time for the citizens to rise their voice and make things happen. Make things change. Everything started with a call through the social media sites to meet and camp at Puerta del Sol ( a central square in Madrid) last Sunday. This would go on until next Sunday when local and regional elections will take place. At the same time in other cities, mass meetings were organised as well to support this big meeting in Madrid. The tags ♯spanishrevolution, ♯yeswecamp, ♯nonosvamos (we are not leaving), ♯acampadasol (camping in Sol), ♯15M... spread through twitter very quickly... and more and more cities were joining this call. Pictures and movies from every part of Spain were shared and more people showed their support to this initiative. But there is also a sad part in this story. On one hand, the police action last Sunday in the demonstration hitting the protestants and taking some of them under arrest, as well as prohibiting them to go back to Puerta del Sol again. On the other hand, the low coverage by the Spanish big mass media. This situation in Spain needs to be told and everybody needs to know what is happening. And it needs to be told not only in Spain but in the rest of Europe and the world. So, I ask you, who are reading this, to spread the word about what is going on in Spain. 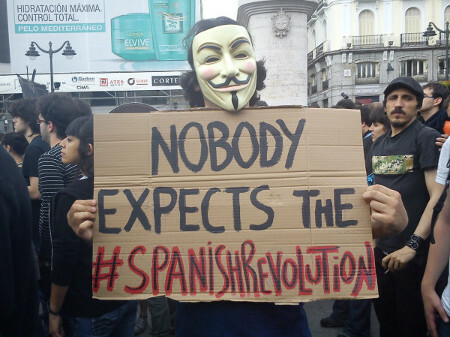 Because the ♯spanishrevolution is happening!!! !